Boating on the Thames, you discover historical cities and untouched countryside. Boating vacations on the Thames are a pleasant way to travel through South East England, a region soaked in history and luscious nature. As you gaze at magnificent Windsor Castle, Hampton Court Palace or the Bridge of Sighs in Oxford, you feel transported back in time. The river meanders through large towns and cities with shops, pubs and museums. You’ll also stop in small villages where the pace is slow and the living is easy! The Thames River is perhaps one of the world's most historic waterways. That becomes obvious as you travel to Windsor Castle, Hampton Court Palace and Cliveden House. But the history and heritage is everywhere! Often you'll dine in a pub that was built 500 years ago! Kids will love LEGOLAND Windsor Resort with its fun rides and live shows! While the family is seeing Hampton Court Palace near Kingston-upon-Thames, why not build time in to enjoy Chessington World of Adventures. It's perfect for kids under age 12! The beautiful Thames River boasts gorgeous reaches where the riverboat fishing is superb! There are free fishing sites set up for anglers anxious to land roach, perch, barbel, chub, pike or carp! Fish free at Oxford and Reading! The River Thames has been England’s most important river for millennia. It served as a major artery for shipping goods at home and abroad, and as a protected base for the British navy. It’s still busy in places. From its source in the Cotswold Hills it flows 346 kilometres (215 miles) to the North Sea. Only the Severn River is longer. At its mouth, the Thames is five miles wide and home to delta wetlands teeming with birds and marine life. 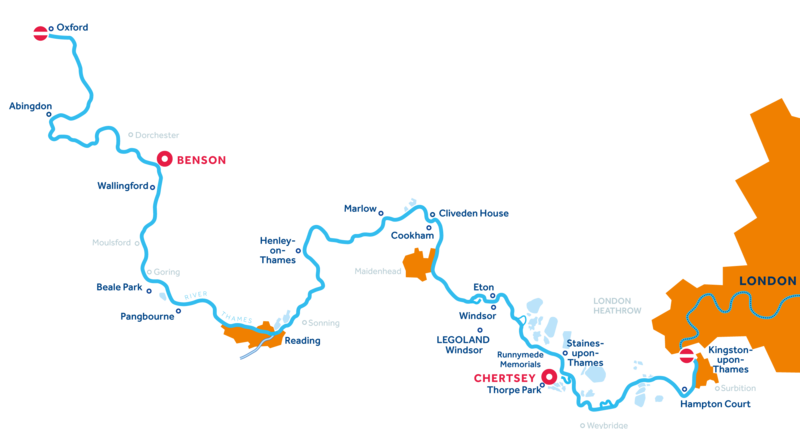 It helps to have this general Thames River information to get an idea of the size of the waterway. Your Boating Vacations on the Thames will take you from just above London to lovely Benson. You’ll find it’s a perfect stage for a River Thames boat rent! The river flows past meadows, woodlands, mediaeval villages and castles, and it’s simply delightful! Great rivers almost always spawn great cities, and the Thames is no exception. The first settlers to arrive were probably Stone Age nomads, based on the discovery of Neolithic manmade shards. Bronze Age wanderers also came. In A.D. 43, Roman legionnaires occupied England and built a seaport they called Londinium near present-day London Bridge. The Thames became the lifeblood of England from then on, assuming its important place in world history. The Thames River is easy to navigate and suitable for beginners. Traffic can be heavy at times. Locks on the Thames are automatic and operated by keepers. There is no lock charge.Cruising beyond Teddington Locks towards central London is prohibited. Opening hours: During the busy summer season locks are open 09:00 to 19:00 (7:00 p.m.) every day in July and August. They close at 18:00 (6:00 p.m.) in May, June and September. Locks are closed for lunch between 13:00-14:00 (2:00 p.m.). Moorings are plentiful on the Thames River. Oxford, the City of Dreaming Spires, will inspire and enchant you with its architecture and vibrant atmosphere. Home to royalty and scholars for over 900 years, it is full of old buildings, many owned by the famous University. Excellent shopping, museums and tours will keep you busy for a whole day at least. Abingdon, a lovely market town, has some 56 buildings from the 17th century and prior. Evidence also exists of a 6,000 year old settlement, making this the oldest, continuously-occupied town in Britain. By contrast, it's known for its MG car manufacturing and was one of the UK's first towns to offer free wi-fi for all. Dorchester-on-Thames is a village at the confluence of the River Thames and its tributary The Thame. It is ideal for exploring the beautiful surrounding countryside by foot or bicycle. For something different to do, nearby Day's Lock hosts the World Pooh Sticks Championships every spring. Cruising from Benson takes in the best of the great British countryside. If you like tranquil, pretty stretches of water and acres of open pastures, hills and farmland - this is the right end of the Thames for you. The Royal Borough of Wallingford was once home to 14 churches! While most are long gone, there’s still plenty to see, from independent shops and markets to cafes and restaurants. Markets are held every Friday with a farmers’ market on the third Tuesday of each month. The castle ruins and gardens are a nice place for a picnic. Wallingford is perhaps most famous for being the home of Agatha Christie and the setting for many of her stories. A small, but pretty village which faces South Stoke on the opposite bank. South Stoke has a quaint church and a 17th century village pub. Neither village has any shops but the highlight in Moulsford is the famous Beetle and Wedge Hotel. This pretty town sits between the Chilterns and the Berksrent Downs within a designated 'Area of Outstanding Natural Beauty'. The Norman church of St Thomas can be seen overlooking the river and there are many shops, restaurants and bars to help while away a lazy afternoon. Pangbourne dates back to Saxon Times. Lord Nelson's Bo'Sun lived in Pangbourne and is buried at St James the Less church, built in 1660. The individual shops are full of character and the surrounding area is ideal for walkers, photographers and artists alike. Mapledurham is one of the most picturesque spots on the Thames with views of Mapledurham House and the country's last working mill, which still produces stone-ground flour. Mapledurham has one pub, The Pack Saddle, in Chazey Heath. Famous as one of the UK's top ten retail destinations, the heart of Reading offers much more than superb shopping. The Forbury Gardens, a nationally acclaimed Victorian formal garden, leads you beautifully to the ruins of Reading Abbey, an ancient monument and burial place of a King of England. Sonning-On-Thames is a picturesque riverside village with half timbered Tudor houses and is one of the prettiest stops along the Thames. Sonning Lock, with its colourful gardens, is lovely place for a stroll and the impressive arched bridge, built in 1775, spans the River Thames perfectly. Best known for its Royal Regatta, Henley is synonymous with rowing and attracts some of the world's finest rowers. Just a few strides from the riverbank is the heart of Henley with its historic church, town hall and market square, the latter bustling with busy stall-holders and shoppers on market days. Marlow is a charming Georgian market town, spanned by an elegant suspension bridge. Marlow is the venue for the annual royal ceremony of 'Swan Upping' when cygnets are tagged, and for the Marlow Town Regatta, held in June. With its many restaurants and bistros, every month in Marlow has a vacation feel. Cookham is a pretty village with a delightful High Street that has changed little over the centuries. Today it boasts many fine restaurants and inns. Kenneth Grahame lived in Cookham and is said to have been inspired by the River Thames at Cookham to write The Wind in the Willows. As the river snakes past Cookham, the beechwoods rise steeply and you will see the Cliveden Estate. A country retreat on a grand scale, it was once the glittering hub of society; visited by virtually every British Monarch since George I.
Maidenhead is an ancient town with a history going back to early Saxon times. This bustling town is now a centre of rowing excellence. It is a popular destination for shoppers and, for those who love fine dining; the area is home to some fantastic restaurants including some Michelin-starred venues. The Royal Town of Windsor is full of history and charm and is home to Britain's largest inhabited castle and royal residence of over 900 years – Windsor Castle. You'll also find a bustling town centre with contemporary shopping, fine dining and leisure activities. Well worth a stop for the day. Across the river from Windsor is Eton, home to the famous public school, Eton College, one of the most exclusive schools in the world with annual fees of around £20,000. The ancient desks and benches bear the graffiti of generations of former pupils, which include 19 former British Prime Ministers. Nearly 800 years ago, King John met with a group of barons on Magna Carta Island in Runnymede. It was here he signed a historic document which is seen by many as the symbolic first step on the road to modern democracy. Today, in this spirit, Runnymede has several memorials to the ongoing struggle for liberty - a trio of thought-provoking places which are worth a stop at to reflect, ponder and remember. Staines is a bustling town which attracts scores of visitors to its impressive retail areas - The Elmsleigh Centre and Two Rivers, as well as the town centre with its pedestrianised shopping area offering a wide range of shops, cafés, restaurants and pubs. This water-meadow alongside the Thames makes a great place to moor up and enjoy a stroll or reflect on world history. It was near here, at Runnymede in 1215, that the historic Magna Carta was sealed. This charter laid down the foundations of much of the current British constitution and law. Chertsey is a town steeped in history. Wander the pretty streets to find restaurants, shops and even a 12th century parish church. See if you can spot the bronze sculpture of Chertsey's 15th century romantic heroine Blanche Heriot, and find out how she stopped time to save her lover's life. Hampton Court Palace, billed as 'The Greatest Palace in Britain', offers a magical journey through 500 years of royal history. Resident included King Henry VII, William III and Queen Mary, who each expanded and modernised various parts. Experience the grandeur and splendour of the state apartments, tour the largest kitchens of Tudor England and get lost in the gardens and the UK's oldest surviving hedge maze. Kingston-upon-Thames was once the coronation place of Saxon Kings (902 – 978). Today this busy market town has developed into a major shopping and entertainment hub, although it retains much of its original charm. It also has a strong arts culture and a vibrant festival programme. When approaching Henley-on-Thames, you gaze at a postcard-perfect scene — sculling crews row sleek craft, and colourful waterfront pubs and shops look inviting. You know you’re in the midst of quintessential England, so you stop for a lunch of roast beef and Yorkshire pudding washed down with a pint of local ale, a favourite on River Thames cruises! Wallingford: The Royal Borough of Wallingford was once home to 14 churches! While most are long gone, there’s still plenty to see, from independent shops and markets to cafes and restaurants. Markets are held every Friday with a farmers’ market on the third Tuesday of each month. The castle ruins and gardens are a nice place for a picnic. Wallingford is perhaps most famous for being the home of Agatha Christie and the setting for many of her stories. Moulsford: A small, but pretty village which faces South Stoke on the opposite bank. South Stoke has a quaint church and a 17th century village pub. Neither village has any shops but the highlight in Moulsford is the famous Beetle and Wedge Hotel. Goring: This pretty town sits between the Chilterns and the Berksrent Downs within a designated 'Area of Outstanding Natural Beauty'. The Norman church of St Thomas can be seen overlooking the river and there are many shops, restaurants and bars to help while away a lazy afternoon. Pangbourne: Pangbourne dates back to Saxon Times. Lord Nelson's Bo'Sun lived in Pangbourne and is buried at St James the Less church, built in 1660. The individual shops are full of character and the surrounding area is ideal for walkers, photographers and artists alike. Reading: Famous as one of the UK's top ten retail destinations, the heart of Reading offers much more than superb shopping. The Forbury Gardens, a nationally acclaimed Victorian formal garden, leads you beautifully to the ruins of Reading Abbey, an ancient monument and burial place of a King of England. Sonning: Sonning-On-Thames is a picturesque riverside village with half timbered Tudor houses and is one of the prettiest stops along the Thames. Sonning Lock, with its colourful gardens, is lovely place for a stroll and the impressive arched bridge, built in 1775, spans the River Thames perfectly. Henley-upon-Thames: Best known for its Royal Regatta, Henley is synonymous with rowing and attracts some of the world's finest rowers. Just a few strides from the riverbank is the heart of Henley with its historic church, town hall and market square, the latter bustling with busy stall-holders and shoppers on market days. Marlow: Marlow is a charming Georgian market town, spanned by an elegant suspension bridge. Marlow is the venue for the annual royal ceremony of 'Swan Upping' when cygnets are tagged, and for the Marlow Town Regatta, held in June. With its many restaurants and bistros, every month in Marlow has a vacation feel. England’s city of learning, venerable Oxford, rises in understated grandeur over the shimmering blue of the Thames. You’re all set to go ashore to sightsee, shop, dine and trek the river’s excellent trail. The laid-back quality of the landscape has soothed you, and you’re glad you made sure your Thames riverboat cruise included some bird-watching at Benson Lock. Dorchester: Dorchester-on-Thames is a village at the confluence of the River Thames and its tributary The Thame. It is ideal for exploring the beautiful surrounding countryside by foot or bicycle. For something different to do, nearby Day's Lock hosts the World Pooh Sticks Championships every spring. Abingdon: Abingdon, a lovely market town, has some 56 buildings from the 17th century and prior. Evidence also exists of a 6,000 year old settlement, making this the oldest, continuously-occupied town in Britain. By contrast, it's known for its MG car manufacturing and was one of the UK's first towns to offer free wi-fi for all. Oxford: Oxford, the City of Dreaming Spires, will inspire and enchant you with its architecture and vibrant atmosphere. Home to royalty and scholars for over 900 years, it is full of old buildings, many owned by the famous University. Excellent shopping, museums and tours will keep you busy for a whole day at least. You have fun trying to make the palace guards at Windsor Castle smile, but you don’t succeed! Then you take a picnic lunch to the Royal Gardens to relax under the warm sun, vastly content from the rigors of the morning. Royal Cruise boat vacations on the Thames have bewitched with the grand castles and homes you’ve seen so far! Cliveden: As the river snakes past Cookham, the beechwoods rise steeply and you will see the Cliveden Estate. A country retreat on a grand scale, it was once the glittering hub of society; visited by virtually every British Monarch since George I.
Cookham: Cookham is a pretty village with a delightful High Street that has changed little over the centuries. Today it boasts many fine restaurants and inns. Kenneth Grahame lived in Cookham and is said to have been inspired by the River Thames at Cookham to write The Wind in the Willows. Maidenhead: Maidenhead is an ancient town with a history going back to early Saxon times. This bustling town is now a centre of rowing excellence. It is a popular destination for shoppers and, for those who love fine dining; the area is home to some fantastic restaurants including some Michelin-starred venues. Eton: Across the river from Windsor is Eton, home to the famous public school, Eton College, one of the most exclusive schools in the world with annual fees of around £20,000. The ancient desks and benches bear the graffiti of generations of former pupils, which include 19 former British Prime Ministers. Windsor: The Royal Town of Windsor is full of history and charm and is home to Britain's largest inhabited castle and royal residence of over 900 years – Windsor Castle. You'll also find a bustling town centre with contemporary shopping, fine dining and leisure activities. Well worth a stop for the day. Every mediaeval village you pass draws the eye with ornate buildings and beautiful waterfronts. You’ve just gone by Beale Park outside Goring, but you didn’t stop for a picnic. Instead, you travel on to spend the night in Henley-on-Thames. You’ve decided to take it slow and easy on your River Thames boat rent, savouring the delights of cycling, golf and hanging out in friendly pubs! Runnymede: Nearly 800 years ago, King John met with a group of barons on Magna Carta Island in Runnymede. It was here he signed a historic document which is seen by many as the symbolic first step on the road to modern democracy. Today, in this spirit, Runnymede has several memorials to the ongoing struggle for liberty - a trio of thought-provoking places which are worth a stop at to reflect, ponder and remember. Staines: Staines is a bustling town which attracts scores of visitors to its impressive retail areas - The Elmsleigh Centre and Two Rivers, as well as the town centre with its pedestrianised shopping area offering a wide range of shops, cafés, restaurants and pubs. Hampton Court Palace, once the home of King Henry VIII, looms above you and the circular fountain in front murmurs in the background. You smile as you recall the varied charms of your Thames riverboat cruise, a unique way to travel! The world just looks different from a boat, and you know that now at the end of the trip! Cycling, pubs, historic sites — it was all part of the fun! Kingston-Upon-Thames: Kingston-upon-Thames was once the coronation place of Saxon Kings (902 – 978). Today this busy market town has developed into a major shopping and entertainment hub, although it retains much of its original charm. It also has a strong arts culture and a vibrant festival programme. The easygoing pace of a River Thames boat rent relaxes you almost immediately after you get going. The villages with waterside pubs and pretty greens tempt you to stop, and you often do! Cycling takes you into the countryside to get a real taste of beautiful England, and sightseeing is unforgettable in Windsor, where you can feel the presence of the Queen! Standing in front of the stately Hampton Court Palace near Kingston-upon-Thames, you think about King Henry VIII, who once lived there. 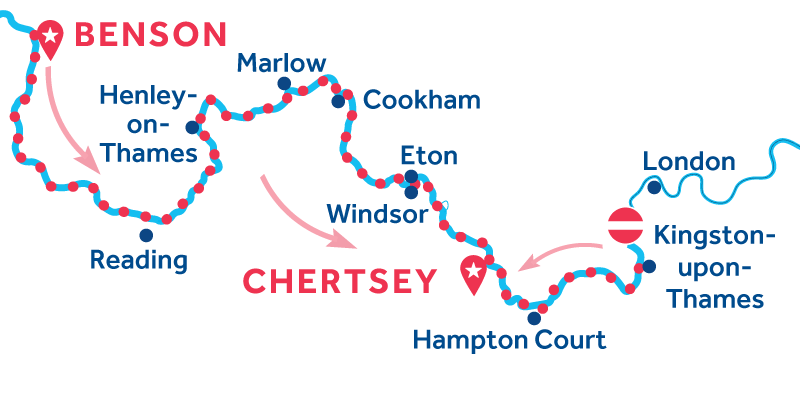 You spend time sightseeing, and then your cruise on the Thames lures you past Chertsey to incredible Windsor Castle. Along the way, you stop often at waterside pubs for a bit of steak and kidney pie! Egham: This water-meadow alongside the Thames makes a great place to moor up and enjoy a stroll or reflect on world history. It was near here, at Runnymede in 1215, that the historic Magna Carta was sealed. This charter laid down the foundations of much of the current British constitution and law. Great service from LeBoat at Benson for our week afloat on the Thames. The base is easy to find, you can park right next to the boats to unload, and all the staff give a friendly and enthusiastic welcome, from checking in to a run-through of the boat's facilities and handling. Also, there's a lovely cafe at the base if you want to just sit and watch the activity, and if you have to wait to collect your boat. The boat, Tango, was perfect for cruising the river as it's easy to steer and moor, and well designed for four. There were only two of us so we had plenty of room and lots of storage space. It can take six with beds made up in the galley area, but that may be a bit too cosy with only one shower/wc. Well designed layout with grippy surfaces and lots of hand rails for those moving about the boat. It even has a 'sun-terrace' on the roof, and you can drive from inside on those not-so-sunny days. Very plesant cruise. Friendly and helpful staff. Plesant cruise. Our first ever hire with them, very good service we were looked after well, especially by Lucy. Will be booking again with them. Thank you for a great few days! Excellent few days, thank you! Thank you for leaving your feedback. We are delighted to learn you enjoyed your cruise and would love to welcome you on board with us again soon. 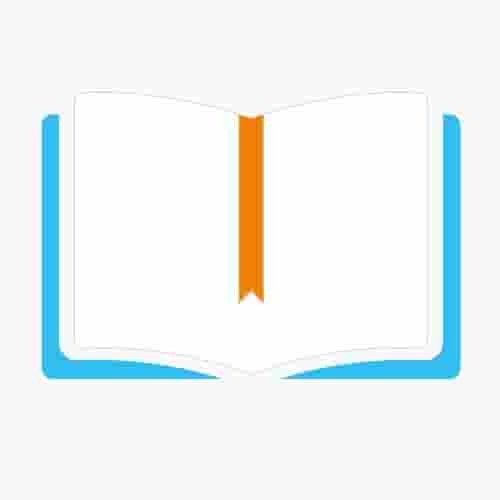 The online booking and any additional items were easily purchased. Arrival at the base was welcoming and check in and ‘training’ was efficient getting us on our way quick to enjoy our short break. Our boat was very well equipped and clean. We had 3 very relaxing days on the Thames- our first time to hire a boat and loved it. Will definitely be booking sgain and have already recommended Le Boat to many friends and family Thank you Base was great- very busy cafe to start ( and end) our holiday. Very happy. The boat was great. Great boat. All good We were very comfortable. Benson is located at the quiet and rural end of the Thames where the river is flanked by rolling countryside and farmland and quaint villages. Moorings are easy to find and the distance between locks is slightly greater than at the river’s eastern end – which means more cruising. The dreaming spires and universities of Oxford is a 6hr cruise to the west of Benson. 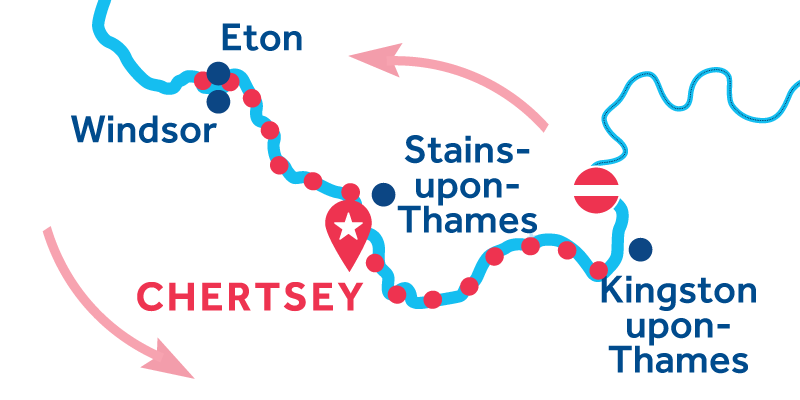 Or, head east and in 6hrs you’ll be in Henley-on-Thames, home of British rowing. Royal Windsor is 12 hrs from Benson. 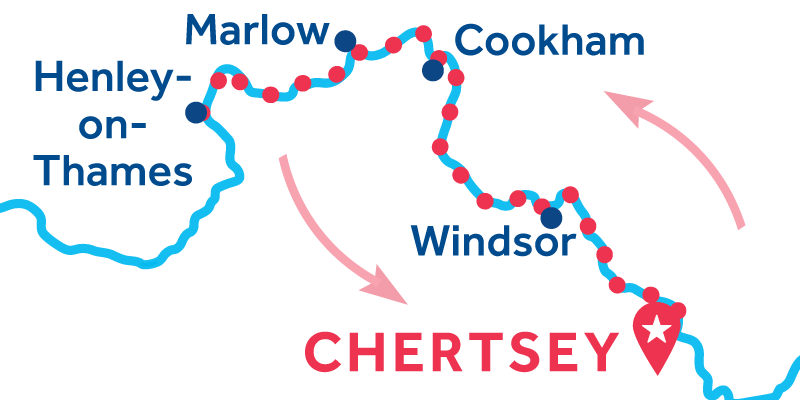 Our Chertsey base is not far from central London, so the river here is bordered by bustling towns and villages with a wider variety of restaurants, supermarkets and pubs than there is near Benson. The historic and grand royal palace at Hampton Court is just 3hrs to the east, with Kingston (and direct trains into central London) another 30minutes after that. 3hr west from our Chertsey base will find you in Windsor and Eton and the countryside vistas become more and more beautiful the further you travel.